The style guides say: keep your sentences short. Write cleanly, cut as many words as you can, and don’t overburden your reader’s short-term memory by delaying the arrival of the full stop. But sometimes a sentence just needs to be long. The world resists our efforts to enclose it between a capital and a full stop. The sentence has to withhold its end because life is like that, refusing to fold itself neatly into subject, verb and object. A long sentence should exult in its own expansiveness, lovingly extending its line of thought while being always clearly moving to its close. It should create anticipation, not confusion, as it goes along. The hard part is telling the difference between the two. I once heard Ken Dodd say that the secret of a great comedian is that he makes the audience feel simultaneously safe and slightly on edge. He has about half a minute from coming on stage, Dodd reckoned, to establish that he is harmless. He must quickly convey calm and control, so that the audience members relax into their seats, safe in the knowledge that nothing truly awkward is about to happen. But he must also create a sense of unpredictability that makes them lean forward. A good long sentence has that same tension. It should frustrate readers just a little, and put them just faintly on edge, without ever suggesting that it has lost control of what is being said. A sentence, once begun, demands its own completion. It throws a thought into the air and leaves the reader vaguely dissatisfied until that thought has come in to land. We read a sentence with the same part of our brains that processes music. Like music, a sentence arrays its elements into an order that should seem fresh and surprising and yet shaped and controlled. It works by violating expectations and creating mild frustrations on the way to fulfillment. As it runs its course, it assuages some of the frustration and may create more. But by the end, things should have resolved themselves in a way that allows something, at least, to be said. A long sentence can seem thrillingly out of breath, deliciously tantalizing, so long as we feel the writer is still in charge. It is like listening to a great singer as he holds his breath and prolongs a phrase. The secret to Frank Sinatra’s singing is his gift for fluid phrasing. Matt Monro may have had better technique, Tony Bennett more lung power, Nat King Cole a smoother tone, Bobby Darin more swing. But Sinatra beat them all at breathing. As a young singer, Sinatra listened awestruck to his bandleader Tommy Dorsey’s astoundingly smooth trombone playing. The note holds seemed to defy human lung capacity. Dorsey would play a musical phrase right through, seemingly without taking a breath, for eight or even sixteen bars. Sinatra sat behind him on the bandstand to learn when and how he breathed, but could not even see his jacket move up and down. Eventually he worked out that Dorsey had a pinhole in the corner of his mouth through which he was taking furtive breaths. Sinatra came to see that singing, too, was about breath control and that the secret was never to break the phrase. In music, legato means “bound together:” a seamless flow, with no break between the notes. Sinatra wanted to sing legato, running the whole phrase into one smooth breath. Sometimes a sentence just needs to be long. The world resists our efforts to enclose it between a capital and a full stop. The sentence has to withhold its end because life is like that, refusing to fold itself neatly into subject, verb and object. He worked out on running tracks and practiced holding his breath underwater in public pools, thinking song lyrics to himself as he swam. His breath control got better and, where he had to breathe in a song, he got better at hiding it. He moved the microphone towards and away from his mouth as he sang so that you never heard him inhale. If he had to sneak in a little breath somewhere he made sure it seemed deliberate, as if he were letting the message sink in. He learned this trick from watching the horn section in Dorsey’s band during long instrumentals. When he sang, it sounded as if he was making it all up as he went along, pausing to pluck a word out of the air, lagging a fraction behind the beat—like a long, lithe sentence, ad libitum but always in control of what it was saying. Unlike writing, which runs with its own irregular pulse, music has a regular rhythm with a steady downbeat. Musical meter controls time completely: a half note hangs in the air for exactly half as long as the whole note. This allows harmonizing singers and instruments to pursue separate agendas and yet still pleasurably coincide. But music also depends on phrasing, which is more subtle and varied than meter. A musical phrase lasts for about as long as a person can sing, or blow a wind instrument, in a single breath. What phrasing does to music is more like what a sentence does to words. A skilled singer can make the phrasing, the sentence structure of a song, work with or against the meter. Pub crooners and karaoke singers never sing in sentences. They focus too much on lung power and hitting the notes and not enough on the words. They just belt it all out, taking gulping breaths midline, killing the meaning and the mood. But skilled singers know that the words matter. They might hold a note for effect, or add a bit of melisma, but mostly their phrasing will mirror the way the words of the song would be spoken. Songs are written in sentences, and phrasing is about singing in sentences, not song lines. A phraseologist like Sinatra overlays the meter with something like confiding speech. He is all about the lyrics—you can hear him enunciate every syllable—and it feels as if he is saying as well as singing them to you, stretching out and twisting the pitch of words as we do in speech. Sinatra sings in sentences. Perhaps he hated rock ’n’ roll for this reason, not because he thought it ugly and degenerate, as he said, but because it did not care about the sentences. The rhythm of rock ’n’ roll always drowns out the syntax. Even a great phrasemaker like Chuck Berry has to make his sentences fit the backbeat. It always irked me that in record shops Sinatra was filed under “easy listening,” the suggestion being that his songs were as undemanding as elevator music, and best heard as the background buzz in a cocktail lounge. Another unfashionable singer filed in the same section, and whom I unfashionably loved, was Karen Carpenter. The emotional power of Carpenter’s singing comes not so much from her vocal tone, gorgeous as that is, but from the fact that she, like Sinatra, sings in sentences. Singing for as long as she does on one breath, in complete sentences over twisting melodies, is an amazing feat—not just of lung capacity but of tricking her throat into thinking that she is not about to swallow. By the end of a Carpenters song you feel wrung out, as if someone has emptied their heart in front of you. All that has happened is that you have been sucker-punched by the dexterity of a technical virtuoso, effortlessly unspooling a long sentence. Easy listening is hard singing—and easy reading is hard writing. When he sang, it sounded as if he was making it all up as he went along, pausing to pluck a word out of the air, lagging a fraction behind the beat—like a long, lithe sentence, ad libitum but always in control of what it was saying. American poetry, from Walt Whitman to Amy Clampitt, offers a vast lending library of these one-sentence poems that pile up free modifiers parted by commas. So many poems work as long, loose sentences—running over many lines, or the whole poem, and inviting us to wonder at how much they can fit inside themselves, and whether they will ever be an adequate vessel for all that needs to be said. as a swift on the wing. Poems, like songs sung well, are made of sentences as well as lines. The sentence is part of a poem’s music just as much as the meter. Line and meter are the flimsy frame behind which the unassailable syntactical rhythms of the English sentence rumble on. For many poets, the unit of composition is not the line but the sentence spoken in a single outbreath. Robert Graves said that a poem came to him in “the usual line-and-a-half that unexpectedly forces itself on the entranced mind.” Poets write in sentences, just like everyone else, then play them off against the meter. Meter, like rhyme, is so strict that it has to pull against something to create its agreeable tensions. Without sentences, poetry would just be sing-song. Think of a long sentence as a poem and it will always be clear, because each part of it will unravel in little musical phrases, with all the different parts coloring one another without it ever feeling discordant. The one indispensable quality in a long sentence is that it must divide into these smaller pieces to be chewed and swallowed one at a time, and still always be moving, with each short phrase, towards completion. A long sentence should feel alive, awake, kinetic, aerobic—like a poem. Think of a long sentence as a poem and it will always be clear, because each part of it will unravel in little musical phrases, with all the different parts coloring one another without it ever feeling discordant. I like this metaphor but am not quite persuaded by it. Is the writer of a long sentence really like an acrobat? Should a long sentence be as showboating as the turns and tumbles of the trapeze artist? I side more with Thoreau, who warned the writer against “trying to turn too many feeble somersaults in the air.” And I am reminded of Burt Lancaster and Tony Curtis in Trapeze, attempting to draw reverential gasps from the increasingly bored circus crowds, while down below an elephant stands on its hind legs or a bear rides a bicycle. A trapeze act is all jumpy, interrupted suspense—the somersault over as quickly as it is seen, with that awkward smack as the anchorman grabs the forearms of his flying partner and the ropes quiver. I am not sure I want to write sentences like that, more death-cheating jeopardy than unforced elegance. And if learning to write is also learning to live, then I don’t want to live like that either. The trick, with both a long sentence and a high-wire walk, is to give off an air of controlled anarchy, of boundless freedom within clear constraints. Wire-walking may be a little more perilous than writing, but both are, ultimately, all about technique. Petit prepared like a scholar for his New York walk, studying photographs, calculating the effects of high winds and building sway, sneaking into the building to case the joint and recce the anchor points. But once he stepped out on to that thin steel cable he had to rely, like the sentence writer, on learned instinct, got through assiduous rehearsal. The high-wire artist must arrange his body so that it fights the wire’s urge to rotate, like any cylinder, when stepped on. He must teach his feet to land on the cable in such a way as to absorb its swaying and then coax his center of mass to move up to his torso, using his ankles as the pivot point. He must know to pass the wire between his big and second toe, along the sole and behind the middle of the heel. A high-wire walk has the rhythm and momentum of a long sentence. “I don’t see fear in my life,” Petit said. “That’s how people die: they are frozen rather than acting and thinking.” The walk, like a sentence, takes place in time as well as space. It cannot be done all at once, and only succeeds if it is in constant motion. The high-wire walker must be ever alert and dynamic—although, like a sentence writer putting in a comma or semicolon, he can pause at the cavaletti, the anchor ropes that create little oases of three-dimensional steadiness and stop the wire swaying too much. In the middle of the wire between the twin towers, as if neatly punctuating a sentence, Petit knelt, lay on his back and waved at the puzzled birds hovering over him. The crowds of people gazing up from the streets below relaxed a little, but could not quite exhale. As Petit neared the South Tower they began to breathe out, and as he made it there they sighed with relief—at least until he turned round and did the whole thing again, making seven more crossings before surrendering to the waiting police. Eight sentences: a high-wire paragraph. The trick, with both a long sentence and a high-wire walk, is to give off an air of controlled anarchy, of boundless freedom within clear constraints. A long sentence too should be a beautiful, indelible gift. It should give pleasure without provisos, not buttonhole and bedazzle the reader with virtuosity. It can put the reader on edge a little, so long as this does not feel like its main point, so long as it feels as if the sentence has no ulterior motive other than the giving of its own life-delighting self. This is what those algorithmic “readability scores” on Microsoft Word will never tell you. They deal only with reading ease, not the knottier, exacting pleasures of expectancy and surprise, the teasing way that long sentences suspend the moment of closure. I am a fully terrestrial being, afraid of flying and scared of heights. On the top floors of tall buildings, I don’t even like being close to the windows. I could no more walk on a tightrope between two towers than I could flap my arms and fly across. Just looking at photos of Petit on that wire makes my legs wobble. But how I would love some day to be able to write a sentence of such pointless, big-hearted, joy-bestowing beauty, one that would make a stranger drop what they were doing and, in the middle of a crowded street, look up. From Issue Number 48 of Five Dials. Copyright © 2018 by Joe Moran. 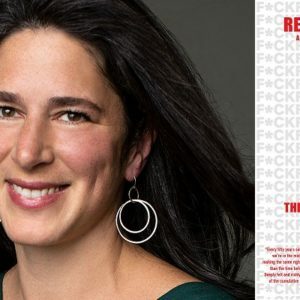 Rebecca Traister: "The Anger of Other Women Can Be Instructive"